Carly Valentine @ The Art Institute of Philadelphia Grad Show at The Philadelphia Sketch Club. 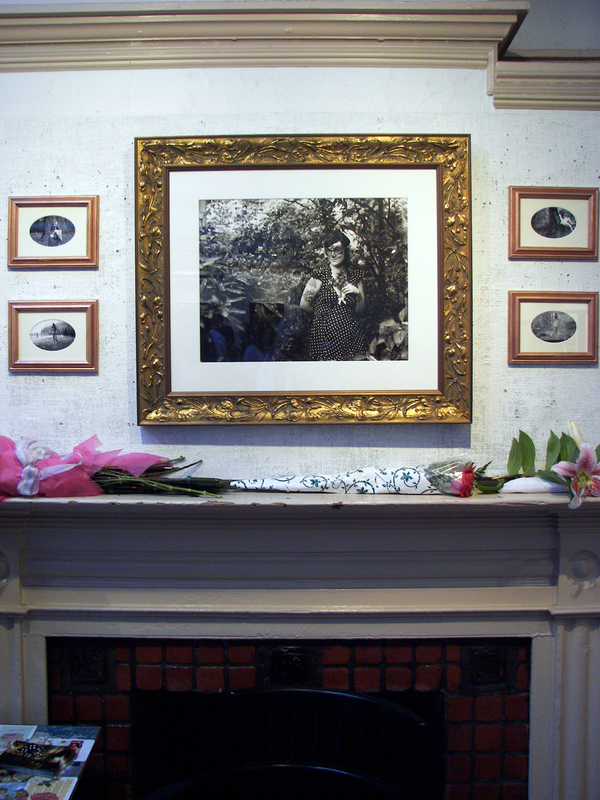 Carly Valentine’s black and white photography looked gorgeous mounted on the historic walls of the venerable Philadelphia Sketch Club Gallery on Camac Street. Four times a year the club hosts the grads of AI to show their work in the gallery with a gala party; a great reason to dress up and have a drink. Valentine’s deeply narrative work, mostly self portraits, nod to modern art with Magritte-like compositions, beaux arts frames and costumes from another era. 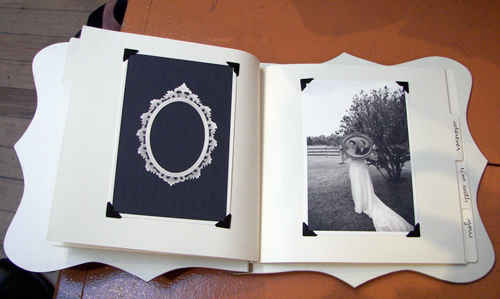 The rich blacks, creamy ecru and dreamy metaphors filled books, the walls over the fire place and the entire “winners wall” of the gallery. Carly was unaware of the historic significance of exhibiting in America’s oldest art club, her grandmother, DoN‘s good friend Jeannette Walsh, was long time president of the Regional Art Association in Clementon, NJ (the foundation of DoN‘s art career), who was a fine artist in her own right, as well as a blue grass musician and entertainer. Jean would be so proud to know Carly is excelling not just in fine art and photography but in being a really nice person, a trait no school can ever teach. Gabriela Girova @ The Philadelphia Sketch Club. John Moore‘s painterly photographs combine natural elements with ethereal industrial constructs creeping into the composition. The grad show at PSC was very gratifying with a focus on business, including business cards, book arts, web sites and unique presentation for their photography, information useful for art students emerging into a competitive market. DoN appreciated that Moore bucked the trend and “forgot” his cards, DoN wrote his name on another grad’s card. 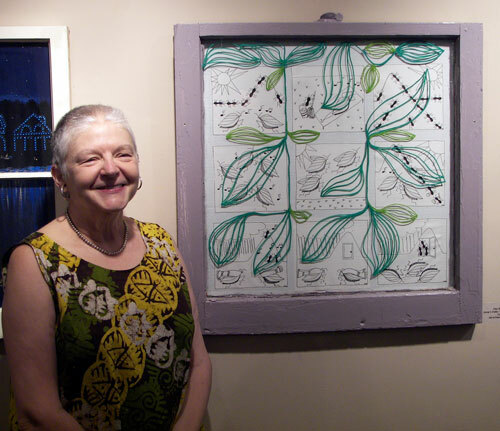 The graduates had a crash course in installing a show at The Sketch Club which concurrently has Phillustration 2010 running, they had to take down a complete show, install a new one, then re-hang the first show in the same order – welcome to the art world! 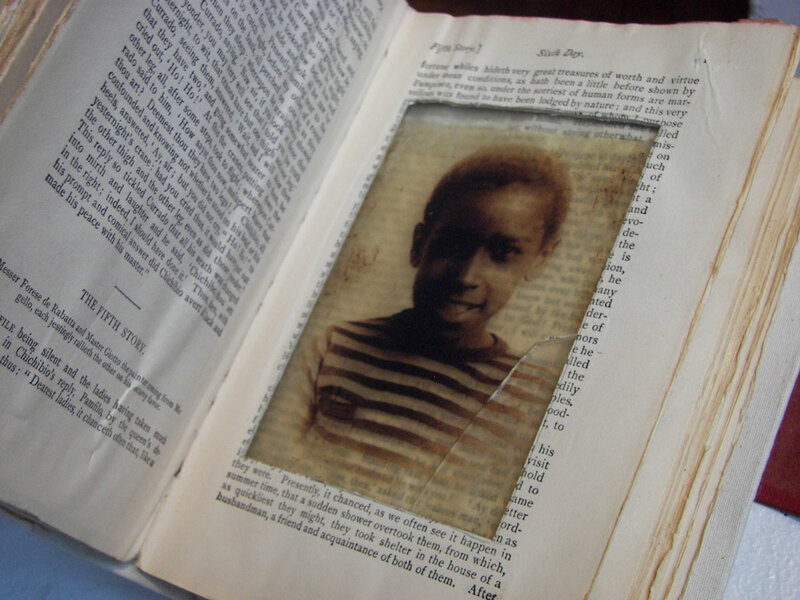 Tamara Brown’s carved books with photo emulsion images inside the books are fabulously evocative and transmogrifying, combining text and technique in a unique mash up. LoVe iT! This entry was posted in Art in Philadelphia, Art Spaces Philadelphia, Fine Art Philadelphia, Philadelphia, Philadelphia Art, Philadelphia Art Clubs, Philadelphia Art Installations, Philadelphia Art Schools, Philadelphia Art Shows, Philadelphia Artists, Philadelphia Artists, Philadelphia Photographers, Philadelphia Sketch Club, Photography Philadelphia, Uncategorized on June 29, 2010 by admin1. 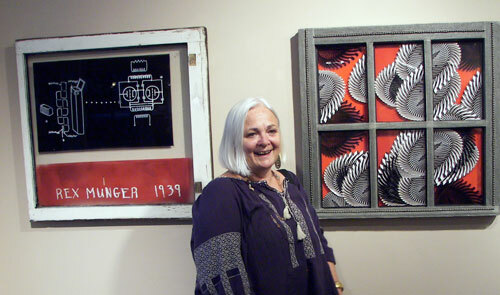 Carol Wisker with her award winning mixed media creation, Machine: War Games Series, when the show first opened at Smile Gallery, Carol won Best in Show. The huge gallery space at RRCA is a wonderful opportunity to see most of the original show hanging together again. 3rd Friday in Millville was really fun with live entertainment tucked into every park, alley and plaza including a glee club performance!!! The creative vibe of the monthly event with art shows, restaurants and shops welcome visitors warmly with small town ambiance and upscale art. Ona Kalstein, Through My Window @ Riverfront Renaissance Center for the Arts. Ted Warchal @ Riverfront Renaissance Center for the Arts special exhibit, Through My Window, A Da Vinci Art Alliance Members Exhibit. Ted, Ona & DoN are members of the Board of Directors of Da Vinci, thanks to all the artists & volunteers who arranged for the art to show up on time and to Dr. Debra Miller & David Foss for the expert installation, the RRCA is a wonderful exhibition space. David Foss & Nicole Koenitzer. 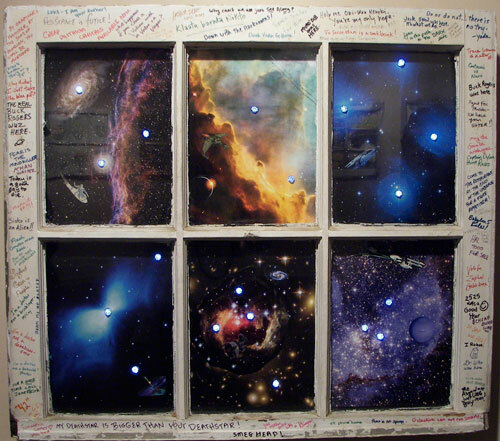 Betsy Alexander‘s Sci-Fi homage drew some teenage geeks into the gallery who seemed mesmerized at the depth of knowledge in the obscure references. Burnell Yow! told DoN he was hesitant when Betsy voiced her encyclopedic idea – but beam me up! 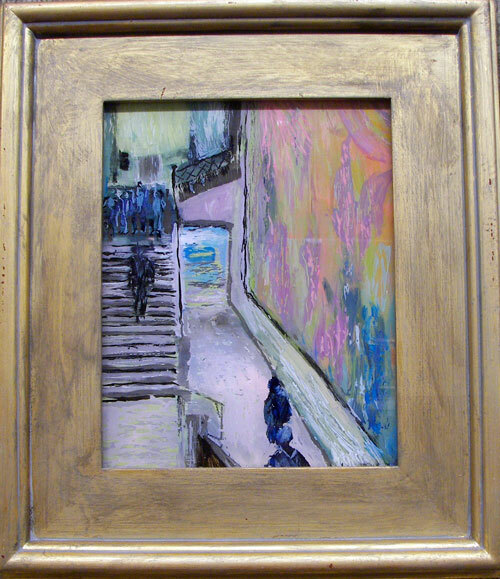 DoN Brewer‘s drawing of Paris rooftops is paired perfectly with Lilliana Didovic‘s Boathouse Row painting. The concept pf Through My Window is that more than 20 artists were offered a window to do whatever they wanted with, the result is a uniquely Philadelphian art perspective: Bobbie Adams, Betsy Alexander, Jesse Best, DoN Brewer, Rachel Citrino. Alden Cole. 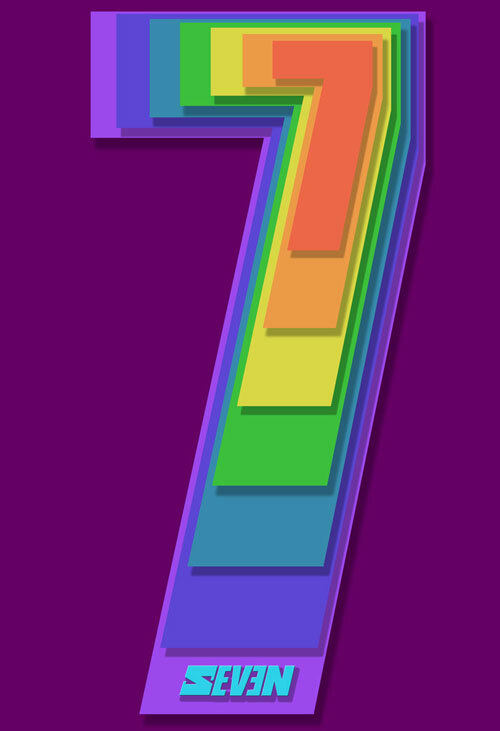 Lilliana Didovic, Jerry di Falco, David Foss, Carl Johnson, Ona Kalstein, Nicole Koenitzer, Gail Kotel, Rikard Larma, Lee Muslin, Liz Nicklus, Kathryn Pannepacker, Michael Shane Simmons, Mike Sweeney, Ted Warchal, Carol Wisker & Burnell Yow! This entry was posted in Animal Art, Art in Philadelphia, Art Spaces Philadelphia, Da Vinci Art Alliance, DoNBrewer, Drawings, Fine Art Philadelphia, Light, Mixed Media Art, Multimedia Art, New Jersey artists, Paintings Philadelphia, Pastels, Philadelphia, Philadelphia Abstract Art, Philadelphia Art, Philadelphia Art Alliances, Philadelphia Art Galleries, Philadelphia Art Installations, Philadelphia Art Shows, Philadelphia Artists, Philadelphia Artists, Philadelphia Photographers, Philadelphia Pop Art, Photography Philadelphia, Plastic Art, Public Art, Recycled Art, Uncategorized on June 22, 2010 by admin1. Da Vinci Art Alliance presents 79th Anniversary Fundraiser, July 17th, 2010. Our annual members show in July is on the theme of Seven; there is no entry fee for submissions, all work will be included, per rules on attached prospectus. 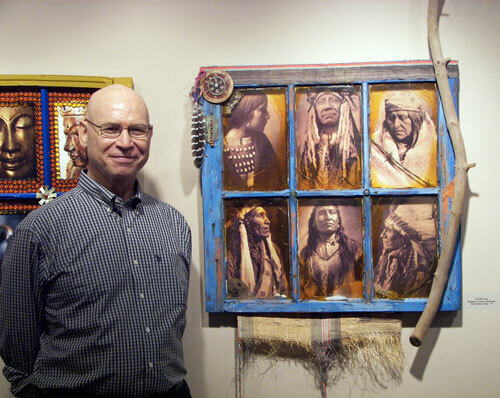 The exhibition will travel to The Noyes Museum of Art in October! *The PPT lecture on “Depictions of the 7 Deadly Sins in Northern European Art of the 15th-17th Centuries” will be presented by Da Vinci President Deb Miller, supported by a grant from the Pennsylvania Humanities Council. All events are free and open to the public. Please plan to attend, and to invite guests! 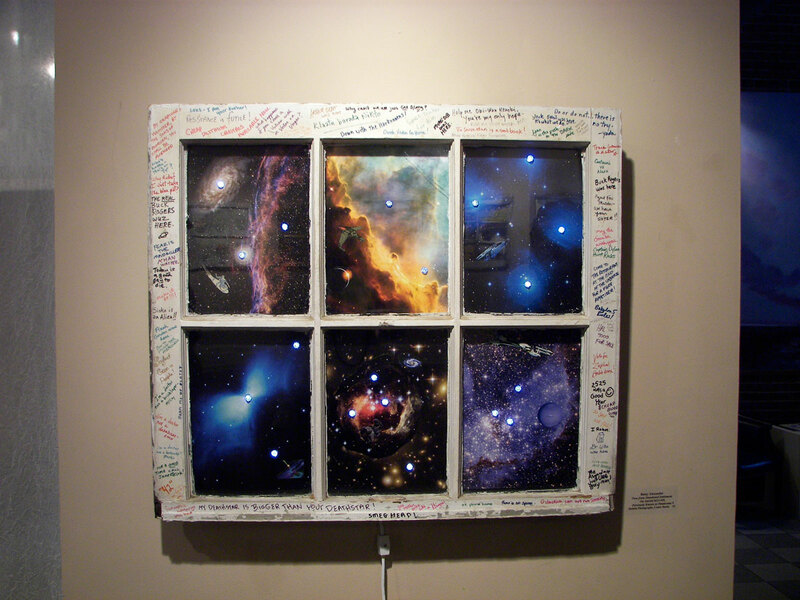 This entry was posted in Art in Philadelphia, Art Spaces Philadelphia, Da Vinci Art Alliance, Fine Art Philadelphia, Philadelphia, Philadelphia Art, Philadelphia Art Alliances, Philadelphia Art Galleries, Philadelphia Art Shows, Philadelphia Artists, Philadelphia Artists, Philadelphia Photographers, Philadelphia Pop Art, Photography Philadelphia, Plastic Art, Prints, Uncategorized on June 22, 2010 by admin1. 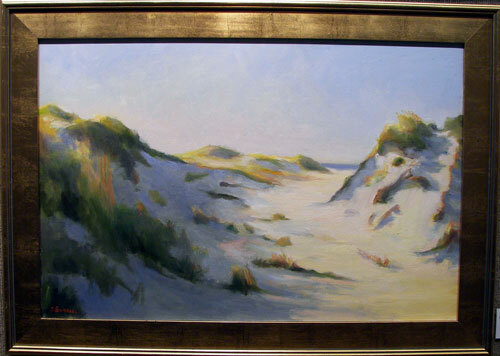 Susan Barnes, North End Dunes, oil. The Annual Members Exhibition of the Philadelphia Sketch Club at Newman Galleries on Walnut Street is a wonderful introduction to the many fine artists who belong to America’s oldest art club. The swirly mix of styles, techniques and ideas is evocative of the Philly art community in microcosm; the mezzanine and third floor gallery holds a heady mix of contemporary art by masters, newbies, wannabes of all ages celebrating the first decade of the 21st Century. 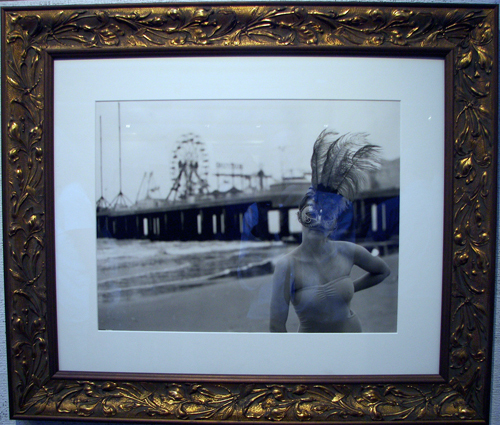 Edna Santiago, Museum Stroll, acrylic on plexiglass. 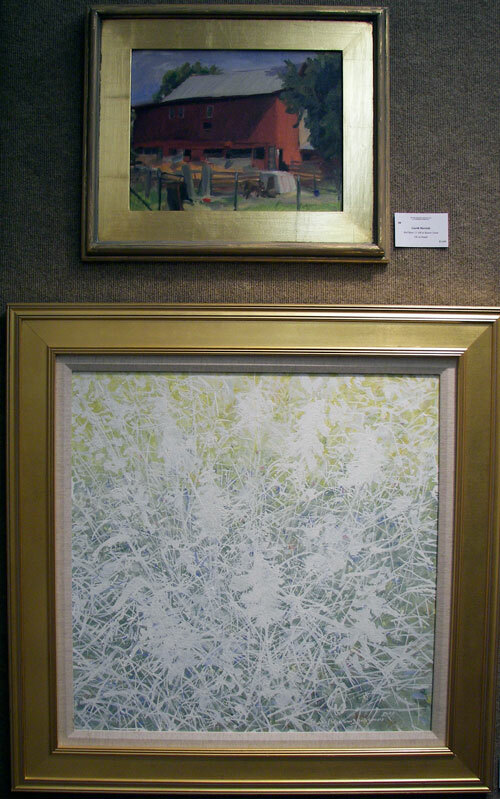 Garth Herrick, Red Barn, 11:00 AM at Beaver Farm and Donald Meyer, Study (Structure) Hosta Series, egg tempera. 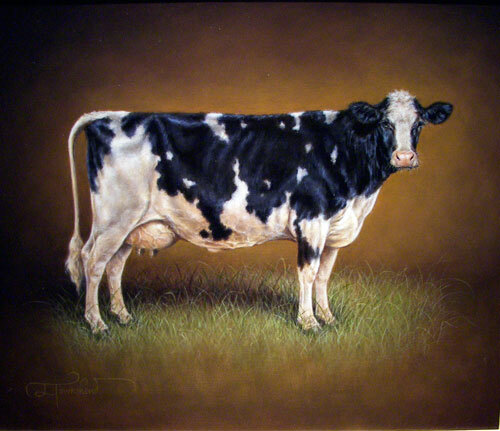 Linda Townshend, Holstein, oil on canvas. 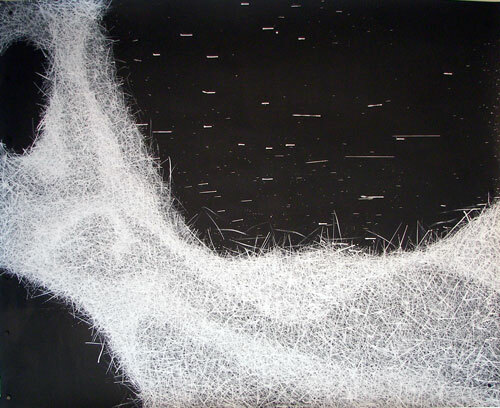 Karen McDonnell, Wisdom, mixed media. Karen e-mails DoN phone pics of stickers of this little guy in public spaces, her contribution to the Philly art scene by introducing graffiti style into the mix of traditional media is like when photography put it’s foot in the door. 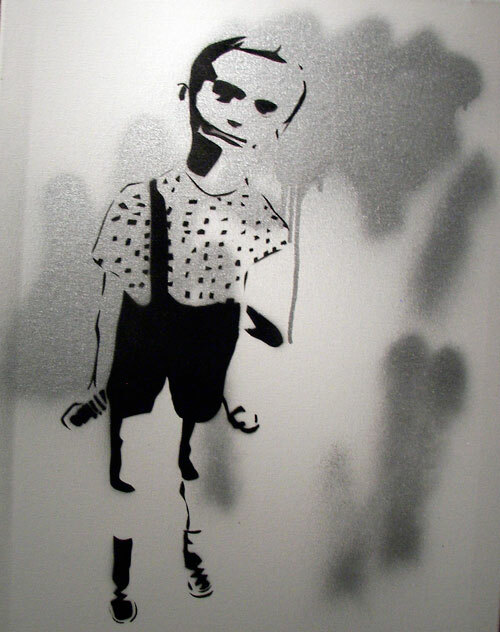 The silver spray paint gives a glamorous luster to the surface of the canvas as if dressed up for the special day when all the artists show their best work. The 2010 Members Exhibition of The Philadelphia Sketch Club @ Newman Galleries with 156 works by as many Philadelphia area fine artists runs through 6/9/2010. This entry was posted in Animal Art, Art in Philadelphia, Art Spaces Philadelphia, Drawings, Fine Art Philadelphia, Light, Mixed Media Art, Multimedia Art, Newman Galleries, Paintings Philadelphia, Pastels, Philadelphia, Philadelphia Abstract Art, Philadelphia Art, Philadelphia Art Clubs, Philadelphia Art Galleries, Philadelphia Art Installations, Philadelphia Art Shows, Philadelphia Artists, Philadelphia Artists, Philadelphia Photographers, Philadelphia Pop Art, Philadelphia Sculpture, Philadelphia Sketch Club, Prints, Public Art, Uncategorized on June 20, 2010 by admin1. Danielle Bursk, Kiss, casein & acrylic on paper. 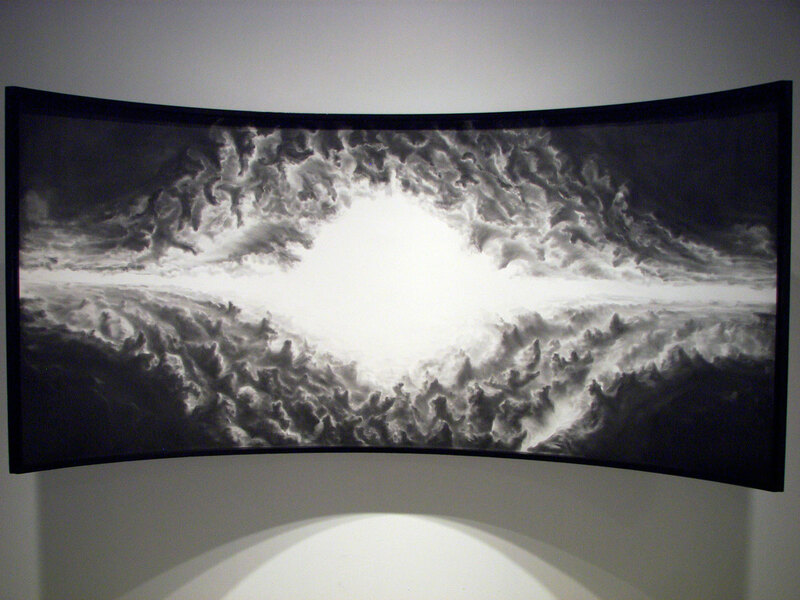 Danielle’s ginormous drawings seethe with energy and motion yet there is a zen like calm in the action drawings. 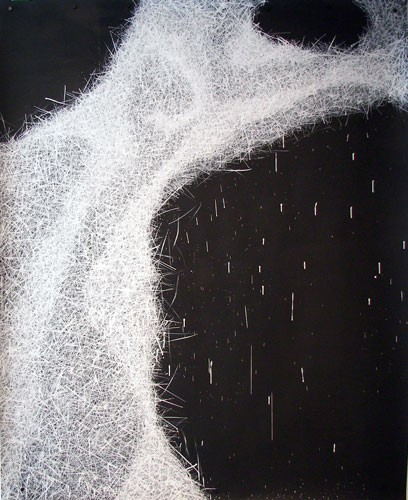 The compositions of flowing plumes of marks are like phosphenes flashing and blinking, like after-images inside your eyelids after staring too long, the dramatic drawings look deep inside the mind. 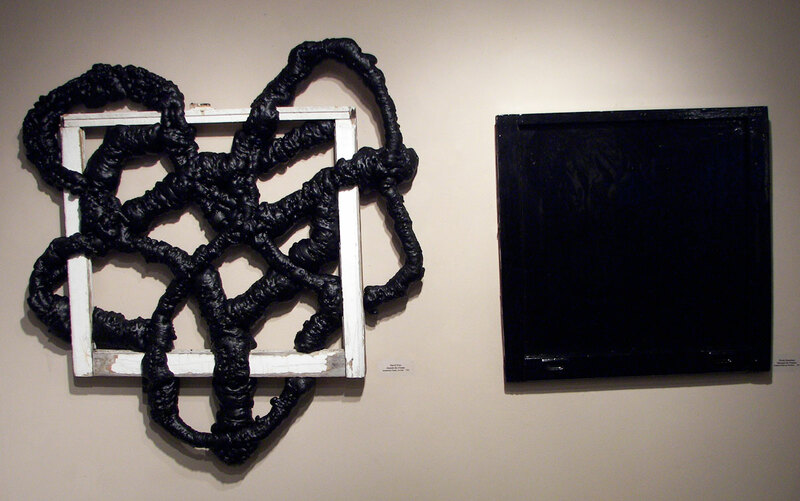 Cecelia Rembert, Eulogy, oil on canvas. Now based in NYC, Rembert is a CFEVA alum currently working on a series of paintings about storytelling the human experience. 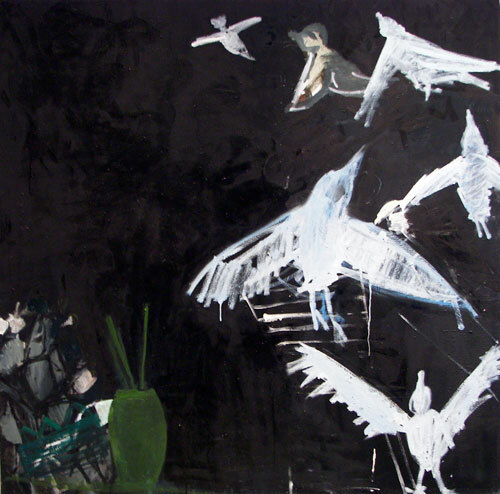 Cecelia’s paintings in the show mostly feature a bird or two reminding DoN of Steven King’s psycho-pomps – the idea that birds are messengers from another realm. The bird images soar and connect with an internal yearning to be able to fly. 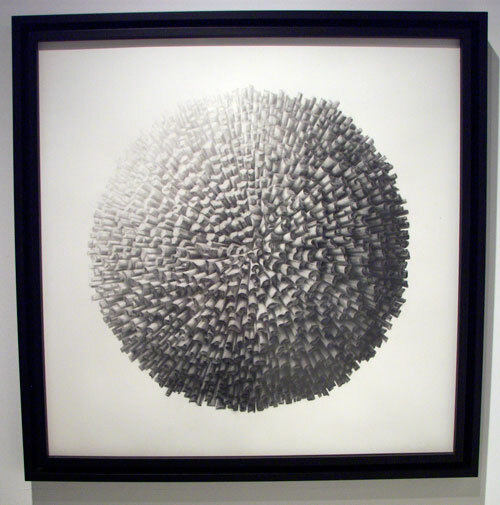 Gregory Brellochs, Gamete, graphite on paper. Gregory Brellochs, XYZ, graphite on paper @ Dalet Art Gallery. DoN did not meet Mr. Bullochs at the opening but the masterful drawings speak for themselves, the liquidy graphite forms cloud shapes, horizons and dream scapes then turns to large scale scientific illustration of imaginary microscopic life forms, the overall effect is introspective and alluring like the shapes that float into your mind as you drift off to sleep. Ana B. Hernandez @ Material Motion. 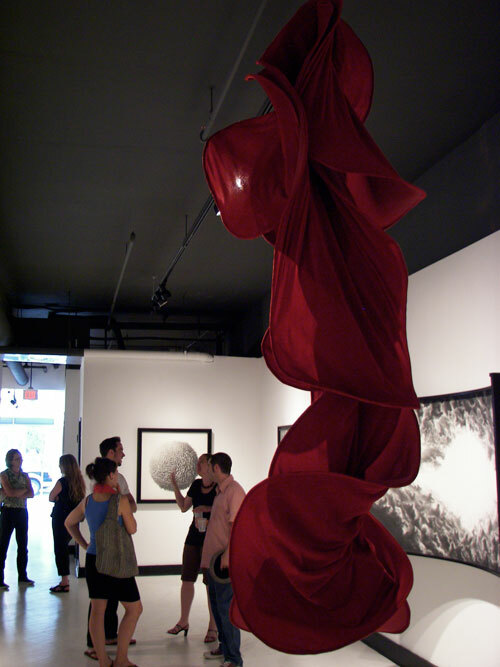 Ana’s swirling scarlet fabric sculptures exemplify the tone of Material Motion, @ Dalet Art Gallery on 2nd Street, the fluid shapes float above the crowd, melding into the mood of the room. The deep red speaks to the large graphite drawings in a secret language of color and shapes. Material Motions is curated and organized by the fabulous team at the Center for Emerging Visual Artists; Amie Potsic has such a dream job of pairing artists with venues and Ann Koivunen works tirelessly to promote the arts in Philly, even though the work is demanding, the level of professionalism and care for the artists is gratifying and inspiring. Works by fabulous Philly photographer James B. Abbott and Christine Elfman‘s ethereal paintings complete the coherent theme the enormous space that is the Dalet Art Gallery allows, each corner is activated and inviting. Later this summer the gallery will be hosting the Princeton Photography Society. 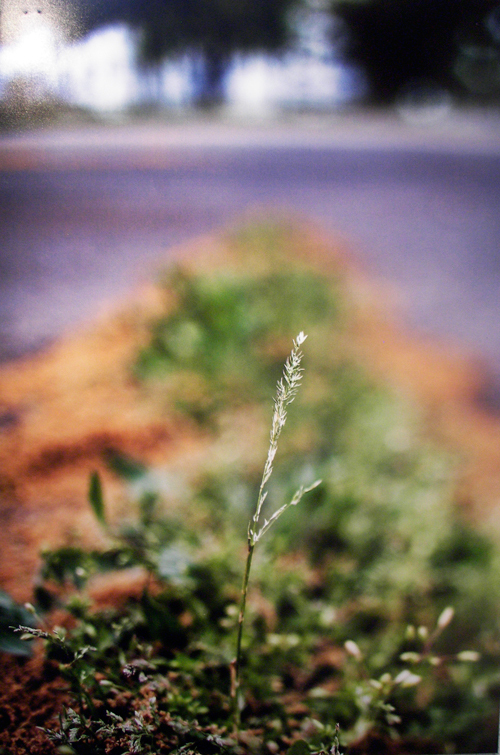 Apologies to Danielle for posting photos sideways – oops! 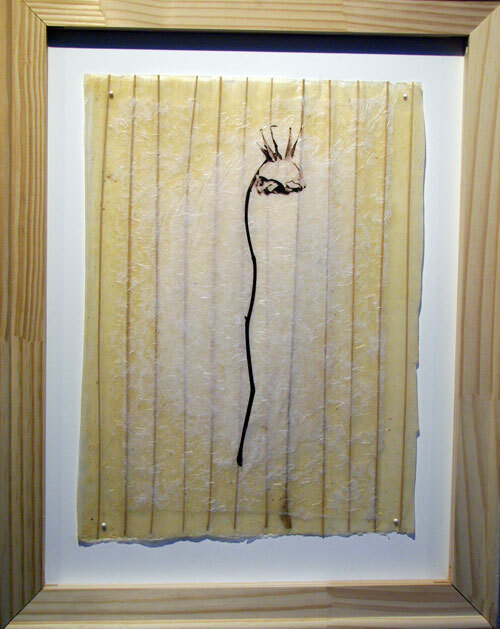 This entry was posted in Art in Philadelphia, Art Spaces Philadelphia, Center for Emerging Visual Artists, Drawings, Fabric Art, Fine Art Philadelphia, Mixed Media Art, Paintings Philadelphia, Philadelphia, Philadelphia Abstract Art, Philadelphia Art, Philadelphia Art Galleries, Philadelphia Art Installations, Philadelphia Art Shows, Philadelphia Artists, Philadelphia Artists, Philadelphia Photographers, Philadelphia Sculpture, Photography Philadelphia, Uncategorized on June 19, 2010 by admin1.